Hurricane Irma struck Florida on September 10, 2017, and knocked out power to 6.7 million electricity customers—64% of all customer accounts in the state—according to reports compiled by the Florida Division of Emergency Management. About 100,000 customers (1% of the state total) remained without power as of September 19. The count of customers reflects the number of billed accounts or individual meters. The number of people affected by power outages is larger than the customers affected because more than one person may be covered by a single electric bill. Hurricane Irma also knocked out power to at least 1.3 million customers in Georgia and close to half a million customers in other states, but nearly all hurricane-related outages in states other than Florida have since been resolved. Hurricane Irma followed the western coast of Florida after first making landfall in the continental United States in the Florida Keys. Irma was the first major hurricane to hit Florida since Hurricane Wilma in 2005. Wilma was a Category 3 hurricane with similar intensity to Irma when it made landfall in the United States at almost exactly the point of Irma’s second landfall near Marco Island. Power outages in Florida rose slowly on September 10, but they increased rapidly overnight as Hurricane Irma traveled up the state. About 15% of customers were without power at noon on September 10, and power outages peaked at 3:00 p.m. on September 11, affecting 64% of customers. In contrast, Hurricane Wilma moved quickly across the southern part of the state, knocking out power to 36% of customers in Florida. Although the percentage of Florida customers without power during Irma was significantly higher than during Wilma, the rate of electric service restoration has been more rapid. Five days after Irma’s landfall, the share of customers without power had fallen from a peak of 64% down to 18% (a recovery rate of about 9% of customers per day). Power outages during Wilma declined from 36% of customers to 16% by the fifth day after landfall (an average recovery rate of about 4% of customers per day). Based on information in the U.S. Department of Energy’s situation reports, nearly 60,000 power company employees from the United States and Canada were involved in restoration efforts after Hurricane Irma. Since 2005, Florida Power & Light and other utilities in the state have made significant investments to improve their hurricane preparedness. These utilities have upgraded electric infrastructure, including replacing wooden utility poles with concrete poles. Utilities have also deployed smart grid technologies, which provide more timely and more accurate information about outages and can help utilities better target restoration efforts. Power outages were widespread across the state during Hurricane Irma, but some counties were more affected than others. At the height of the storm on September 11, there were 12 counties in Florida that had 90% or more of their electricity customers without power. Power was restored to most of these customers relatively quickly. However, even one week after landfall, four counties in the southwestern part of the state had power outages that affected more than 20% of electric customers. 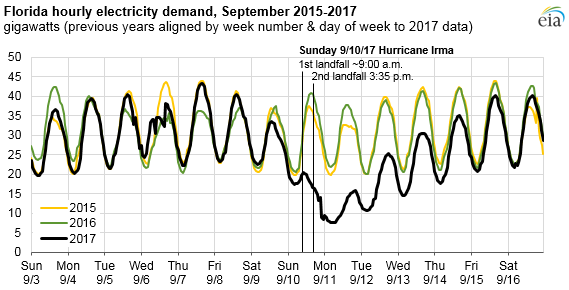 After the hurricane made landfall, demand for electricity during the early hours of September 11 fell to 7.2 gigawatts (GW), which is 64% lower than the power demand during the same hours in 2016. By the afternoon of Friday, September 15, power demand in Florida had risen to 38.1 GW, close to the level of demand during the same week last year. Hurricane Irma also affected Florida’s two nuclear power plants, which are among the largest power plants in the state. One reactor at the Turkey Point nuclear power plant in south Florida was shut down as a precaution before the hurricane arrived. The other nuclear reactor at the plant was later shut down because of a mechanical issue. The St. Lucie nuclear power plant remained operating, although at reduced levels. All of Florida’s reactors had safely returned to full power by September 18.